“Running after work in Newton is essential for my marathon training, but it wouldn’t be possible or safe without my LiteBelt”. 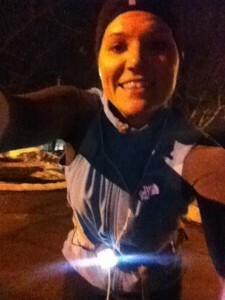 It’s dark out and yeh, that’s snow in the background, but Coreen is going to be ready – no excuses. It’s the thousands of runners that step up to the starting line come race day and are ready that we cater to. They work hard, have families & commitments, but they find the time to train. That can mean 5am or 10pm, but for most of them it’s done in the dark. Daylight savings time just added an hour to sun-up on those early morning runs as well. We will be at the Boston Marathon Expo April 12-14th (booth #2023) this year with our complete line of wearable lights for runners like Coreen who do their miles no matter what. From there, we will join the Reach the Beach crew for their Spring event in Massachusetts. RTB has been running their over-night relays for 15 years now, with an impeccable safety record. GoMotion is proud to partner with them as the official light supplier. Spring events are coming fast, now’s the time to train & be ready!